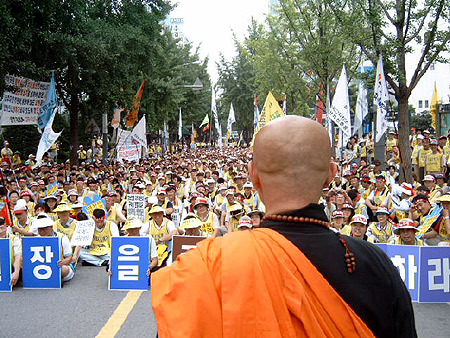 Yesterday more than thousand mainly teachers and their supporters, like students organized in Da-hamkke (All Together), took the streets of Seoul to protest against the government’s plans to implement NEIS (see also our article “After last Saturday’s demonstration against NEIS…”). 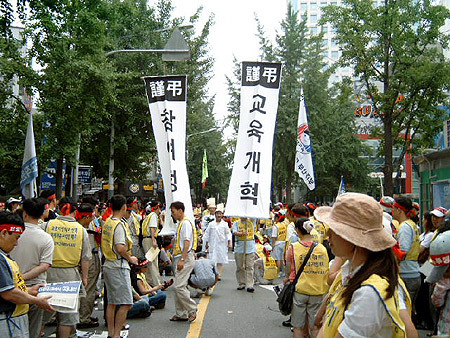 But the South Korean government gave also a new reason for to protest: Last Thursday, July 17th police arrested Won Yeong-man, the president of Korean Teachers Union (KTU) for “taking illegal actions”. They accused him organize “illegal” strikes. Actually until now there was no real strike. 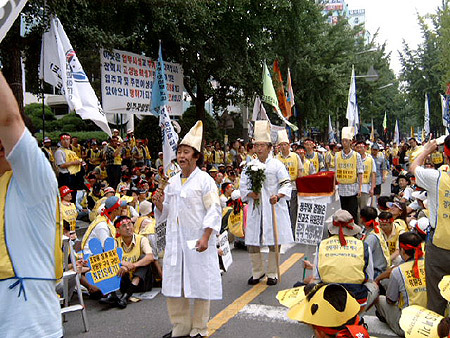 Per example most of the participants of the demonstration on Saturday, June 21st used one vacation day. 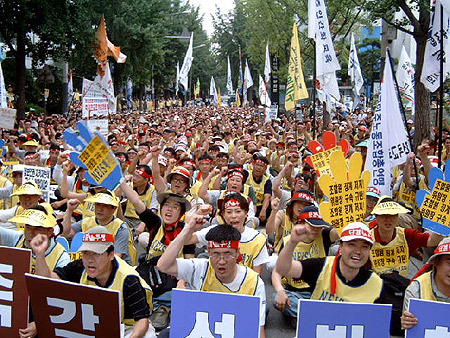 So it means just the call for a demonstration in South Korea can be an “illegal” activity? 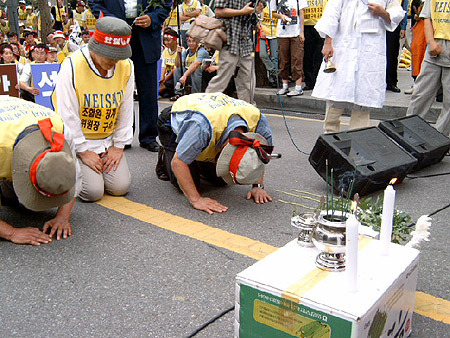 Last Saturday, on the first demonstration, downtown Seoul the protesters shouted: “Let’s bury this government!” And actually on the end of the rally a group of teachers celebrated the symbolic funeral of the South Korean government (see the pictures below). 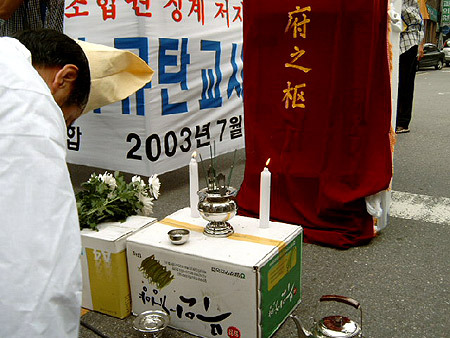 Of course during the rally the demonstrators and the speakers demanded the immediately releasing of Won Yeong-man. But this rally was only the beginning on Sunday. 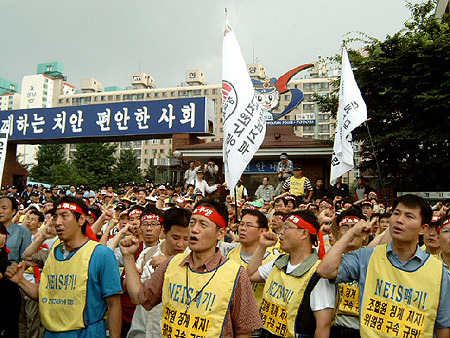 It was followed by another massive demonstration in front of Yeongdeungpo police station, where Won is in arrest, also for the demand for releasing the president of KTU. 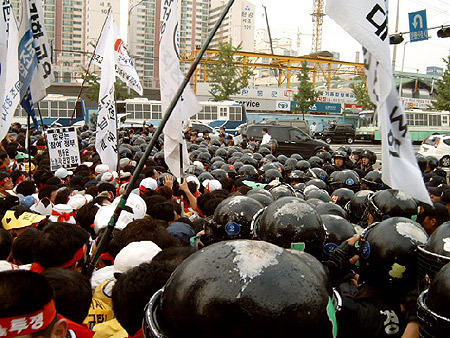 The demonstrators wanted to send a delegation to the prisoner, but they were blocked violently by the riot cops. 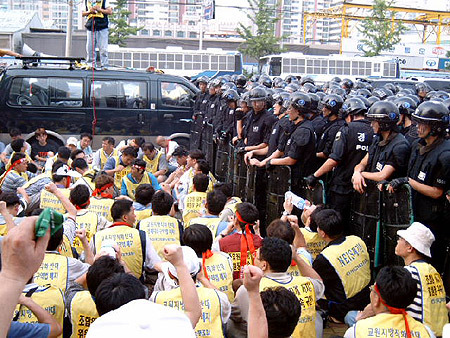 During scuffling with the demonstrators the cops arrested one more teacher. Of course the protesters demanded also his release and threatened to block the road until the night, or the next day if it would be necessary - four hours later he was free. On the end of the demonstration the participants promised never to accept governments order to fill NEIS with any data, even so the government would plan to arrest much more activists. [Related Pictures] Let's bury this government!